Saturday's race may be the moment history will remember, but the day after is when the real magic happened. The blanket of flowers draped over Blame following his Breeders' Cup Classic victory hang outside his barn. Over the last couple Breeders’ Cup posts, the recurring theme has been my standing as a lucky son of a gun. Evidence of this fact was apparent throughout Breeders’ Cup weekend, but at no time was it more clear than on Sunday, the day after the Breeders’ Cup Classic. The day started around 7:30 a.m. on the Churchill Downs backstretch. It was not warm. A cold haze had settled over the track as horses headed out for their morning jogs or back to their barns – not quite frost and not quite fog, with a dash of spray from hoses cleaning up the ground near the barns. I nodded to the backstretch guard as I walked by like I owned the place. After covering three major events at Churchill Downs, the power-drunkenness of having the proverbial skeleton key has yet to wear off. After some wandering, I came across superstar freelancer Claire Novak and super-skilled photographer Jamie Newell loitering around the barn of trainer Al Stall, Jr.. I’d be lying if I said the Breeders’ Cup Classic-winning trainer’s barn was anything close to abuzz following his charge Blame’s epic victory in the previous day’s race. A few reporters filed in and out of Stall’s office for interviews while another group congregated around the stall of the victorious horse. The blanket of flowers that hung from Blame’s withers following his big win now sat idly on a security barrier, drawing little attention. If I really wanted to, I probably could have made off with it and gotten a few hundred yards before getting tackled by security, but I was on the clock. As Jamie snapped photos of Claire with the newly retired colt, I overheard someone say Stall was soon to be bound for a plane to New Orleans. As Stall was one of the people I had to interview that day, this suddenly boosted my urgency to around Defcon 3 (I am not sure whether the Defcon scale goes up or down, but three sounds like a number that would be somewhere in the middle). Shortly after this revelation, Stall emerged from his office and chatted with the people gathered around the horse. As he left that group, I hopped over the ravine that separates the barns from the middle area, flashed my media credential and asked for a chat. We spoke about Blame’s big win, what it meant to him, the horse’s future and the potential of reloading for next year with Ack Ack winner Apart. I knew he had a plane to catch, so I tried not to hold him for too long and let him go on his way with everything I needed. As I alluded to earlier, the scene was eerily quiet for a barn that just won a race worth two and a half times as much as the Kentucky Derby and beat arguably the best, or at least the most beloved, horse of the last five years, if not longer. In total, I do not recall there being many more than 20 people around the Stall barn at any one time, including myself, security and the trainer’s employees. Why the lack of fanfare for the colt who could very well end up being named Horse of the Year? Remember that beloved horse from the previous paragraph? Her going away party was in progress just a few barns over. When I got to Barn 41, a pair of healthy crowds had formed around that horse, some readers may know her as Zenyatta, and her trainer John Shirreffs. The human subject was answering questions outside the barn while his star charge grazed in a nearby grassy area. Shirreffs kept an even keel with his responses considering he missed out on just a little under $2 million by a head. 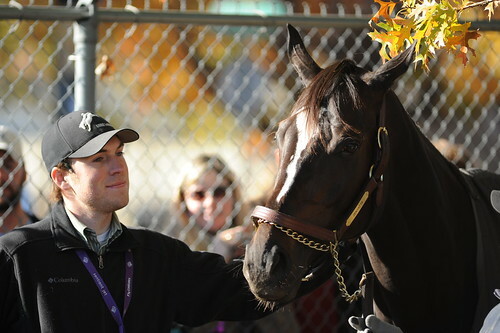 However, after the ride Team Zenyatta has had over the last three years, there was plenty to be proud of. After Shirreffs wrapped things up, the media types migrated from the barn to the half circle surrounding the champion mare. Compared to the roughly 20 people in the vicinity of Blame’s stall, it would not be hard to venture an eyeball guess of 150 fans, horsepeople, media workers and other interested parties came and went throughout the morning. Zenyatta’s patch of grass was next to the fence separating the backstretch from urban Louisville. Whether word got out that the mare would be making an appearance that morning or fans just regularly camped out near her barn hoping she would grace their presence, they showed up en masse for Zenyatta’s sendoff. The fans on the outside looking in crammed against the fence and stuck their fingers and camera lenses through the chain link fence in hopes of getting a brush with the champion or offer her a peppermint (which the horse’s groom surprisingly allowed her to partake). So many cars lined the sidewalk that photographers trying to capture the enormity of it all couldn’t fit them all in the shot. The give and take between Zenyatta and her separated fans was something to behold. The crowd oohed and giggled at every toss of the mare’s head and poke of her hoof. In return, Zenyatta looked out at the crowd and appeared to make eye contact with each and every one of them. Not to sink too deep into simile, but it was like when the entire section of a concert hall thinks a rock star is singing a song just for them. Whether was inquisitiveness, friendliness or an ego the size of Idaho, Zenyatta repeatedly tugged her groom, Mario Espinoza over to the fence to visit with the masses. On my side of the fence, a flurry of cameras clicked and snapped, from professionals with foot-long lenses to people with camera phones. Because I wanted to maintain a shred of professionalism during my time on the backstretch, I decided to leave my camera in the car, not knowing this was going to turn into such a love-fest. The blob of credentialed individuals shifted as Zenyatta decided to try new patches of grass to chomp or examine something that captured her attention. That movement was instigated by the nearby security, both uniformed and personal to the horse. While we were shuffled back to make way for the mare, Claire informed me that Zenyatta’s personal security guy had previously worked for such popular figures as Jennifer Lopez and Tom Petty. How one goes from overseeing international musical artists to livestock is beyond me, but all three remain alive and uninjured, so clearly he is good at what he does. Before he left, Shirreffs walked out to meet his star pupil to the sound of more furious camera clicks. To borrow a phrase from author Malcolm Gladwell, this was the tipping point from “look” to “touch”. Soon, people who looked like they had some kind of connection with the connections gathered around the horse to nuzzle her nose, pat her neck and pose for a photo op. For a horse that appears so fearsome when she struts from paddock to post, Zenyatta was surprisingly gentle with the strange people, including small children. After the people who looked like they may have had ties with the horse filed out, Zenyatta was greeted by some higher-ranking members of the group surrounding her – the ones who had been dealing with the mare from the beginning – most notably HRTV analyst Zoe Cadman. At this point, people started getting brave. People in the blob began asking Zenyatta’s security guard for a photo op, and soon enough, a queue was formed. There were plenty of exceptions, but the order of visitation was largely parallel to the unwritten totem pole of racing media types. I don’t know what belittling title Ray Paulick would give my status in the turf writing community, but I knew I had no business demanding to be anywhere near the front of the line. 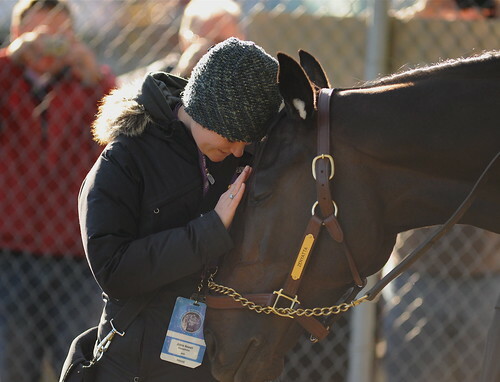 The encounters with Zenyatta ran the gamut of emotions, from joy to awe to tears. This horse meant different things to different people, and after such an emotional final race, it all came pouring out outside of Barn 41. Watching it all unfold with so many of the friends I had made during my short time in the professional turf writing community was the mother of all “lucky son of a gun” moments. Meanwhile, I began to face a significant personal dilemma. Arguably the most photogenic horse on the planet was right in front of me mugging it up for any piece of curved glass within a half mile radius and my camera was in my car on the other side of the backstretch. I could have gone and grabbed it, but risked her being put away and missing what was sure to be a dramatic farewell; or I could have stayed there and taken it all in, but had nothing to show for it, save for other people’s pictures. My photographic memory stinks. I booked it. As I power walked through the shedrows, I glanced over at Blame’s barn. Compared to the scene I just left, it was a ghost town. Who says money can buy popularity? Fortunately, the only thing I missed was a few more fans getting to meet the mare of the hour. Now that several of us in our little group were wielding cameras, we each handed off our equipment to whomever was not currently behind a lens before getting in line for a multi-pronged photo assault. While we watched the legion of lanyard-wearers file to and from Zenyatta, we were joined by the most perfectly-timed backstretch tour van in the history of Churchill Downs. I was far from the only lucky son of a gun on the backstretch that day. After watching enough others get their brush with greatness, I finally worked up the nerve to get in line. It was a bit of a wait, and it took some effort to remind the security guard that I was in line in the middle of the commotion, but I finally got to the front. I wish I could say I was blown away by the monster mare’s physical presence, but I deal with Belgian Draft Horses back home, so big horses are kind of par for the course. However, the ones back home weren’t nearly as smooth to the touch as Zenyatta. When I got to pet Funny Cide during my visit to Ellis Park last year, I considered finding a container to save the gelding’s hair that had accumulated on my hand. That was not an issue with Zenyatta. After that initial pat on the neck, I felt in a bit of an awkward position. While this was unquestionably the “Tell the Grandkids” moment that I was striving for in my Thoroughbred Times TODAY postcards, I was not sure what else to do but pet her on the neck. While everyone else had done everything short of hop on her back and shout “Giddy Up”, the thought lingered that I would be the one to accidentally trigger something that sets her off. I’ve seen what those front hooves can do. With so many cameras pointed in my direction, it would have been a moment that would live in infamy. So I stood there and stroked her neck while repeating the only phrase that came to mind at the moment, “Nice mare.” Smooth. Soon enough, my turn was over and it was time to congeal back into the blob. The festivities continued for another 20 minutes or so before Zenyatta was taken back to her barn. She was given a farewell of cheers and applause, which brought a look of mild panic to the faces of her handlers, who implored the crowd to tone it down. When the noise made it through the cotton ball barriers and into her eardrums, the docile mare who just shared a calm, tender moment with everyone in a quarter-mile radius turned into the aggressive, front-hoof-striking warrior of legend. She strutted her stuff and gave her handler the business until she disappeared into the shedrow. The moral of the story? To turn Bruce Banner into the Incredible Hulk, all you have to do is believe and clap very hard. The crowd stuck around for a little while to collect their thoughts and perhaps wait for an encore, but they eventually dispersed. After the love fest reached its conclusion, I took one last stroll around the backstretch and out to the rail for a glimpse at the massive Churchill Downs grandstand. In a few moments, I would be on its sixth floor writing about everything I just saw. Following all the commotion of Saturday’s Classic card, Sunday’s press box population was sparse. My worktab consisted of a postcard for TODAY and a “morning after” update on Blame, which is where the interview with Stall came into the equation. The deadlines were lax, the weather was getting warmer and when I felt like a break was in order, a day’s worth of races were waiting for me on the other side of the balcony door. This day just kept getting better. My first story in the tank was the one on Blame, which can be read here. Shortly after I turned that story in and started chipping away at the postcard, I saw out of the corner of my eye a congregation of people with recorders or steno pads in hand surrounding a guy who looked pretty important. Then I heard that pretty important guy, otherwise known as head steward John Veitch, talk about punishments for the Calvin Borel/Javier Castellano fight. I grabbed my recorder and joined the group. After gathering the necessary information, I asked around to see if anyone at the Thoroughbred Times office already had the same info and was working on the story. As it turns out, I had something of a scoop, so I can add “breaking news” to the skills on my resume. That story can be read here. I wrapped up my postcard and sent it in shortly after that, finishing my official duties as a Thoroughbred Times mercenary. I was once again a civilian abusing a media pass. At this point, the feeling was akin to a winning football team taking a knee at the end of the game. It was time to soak it all in for one last time knowing I was in the clear. For the card’s feature, Claire (who was pitching a story about the morning’s Zenyatta-Con to ESPN: The Magazine and did a better job of describing it over the phone than I just did in 2,000 words) and I took the elevator down to enjoy the the race from ground level. We took one of my signature “set the timer and run” photos by the Breeders’ Cup statue in the paddock and spent our walk through the tunnel debating which of us was the luckier son (or daughter) of a gun. 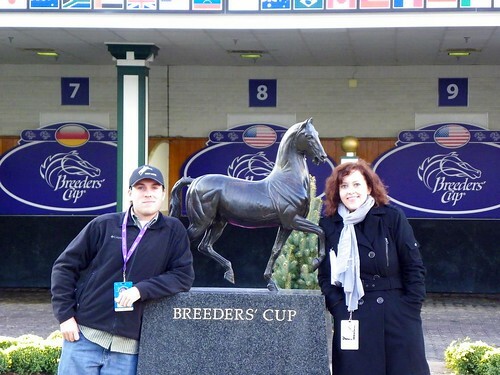 Soon, the day’s races had come to an end, and so had my Breeders’ Cup weekend. A better writer than myself would insert a sentence or two here pulling together the roller coaster of events, emotions, celebrities, stages and shedrows that those five days were – but condensing it all down into that would be doing it an injustice. You just had to be there, and I am a lucky son of a gun for having been there. 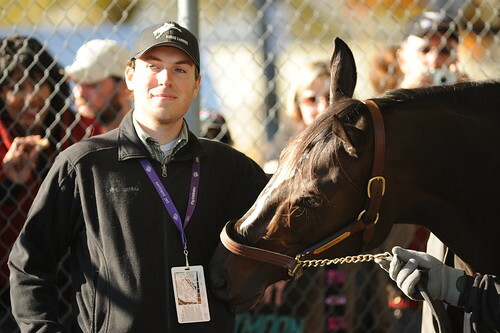 I would like to take this opportunity to thank Thoroughbred Times for allowing me to contribute to their coverage of the Breeders’ Cup and letting me tag along to access people and places that I will be telling others about for a long time to come. I would also like to thank all the friends – old, new or just new in person – that I crossed paths with at one point or another during the whole ordeal. Let’s all do it again sometime. Deal? Behind the jump are some shots of Zenyatta’s going away party, including photographic evidence that I am not making this all up. Zenyatta shares a moment with Shirreffs assistant Frank Leal. I don’t normally post pictures of myself on here, but some things are worth bucking trends. Zenyatta checks out my media credential while I search in vain for the camera. Super-skilled photographer Jamie gets her moment with Zenyatta. The previously mentioned “Set the timer and run” photo of myself and superstar freelancer Claire Novak. Wonderful article! Thank you for it and thanks to Zenyatta for being Zenyatta. You may want to correct caption under one of the photos. That is not Mario but Frank Leal with her. They are often mistaken for each other but that is Frank. A great recap of the morning after! We were there for the weekend and it was a magnificent Breeders’ Cup with two significant exceptions: the Life at Ten incident and the tragic death of Rough Sailing. RIP, young colt. Thank you very much for sharing all of your experiences with us. One lucky son of a gun indeed! Thank you very much! And I fixed the error. Thanks for pointing it out and my apologies for the mix-up. Thanks! It was a sad deal about Rough Sailing. I was going through my pictures about a week after the races and I came across one of him on the backside heading out to the track for a jog. It’s not a particularly great picture from a technical standpoint, but I printed it out anyway. Figured it was worth preserving the memory. How about “hustling tyro”? It was anything but a belittling term used by the handicappers when I worked at DRF in the 1980s. It took a little Googling, but I can definitely live with that title…for now, at least. Also, I’m glad to see you didn’t take too much offense to my good-natured ribbing. Thanks for stopping by! Jack Karlik, my co-worker at DRF and one of the best linemakers in the business, used to write “Hustling tyro aboard” on his “Sweep” graded/morning line comments when a horse that had little else going for him had the services of an up and coming apprentice jockey. I’ve always considered a hustling tyro to be someone with a bright future.